Students can attend free events on campus and access university resources. Various departments and organizations at Texas Tech University will host events and provide resources throughout finals to help students relax, stay healthy and prepare for exams. Some departments also have different hours during finals. Final exam schedules are available through the Office of Official Publications' website. Students can find schedules listed by exam times, common final exams and class times. Students are invited to attend free yoga and mind/body classes to relax before finals. Students are invited to attend free events and study at the SUB. All rooms not considered large meeting rooms will be taken offline and are free to use for studying. All meeting rooms will have tables and chairs for students to study. Students also may use the third-floor collaboration space. Students are invited for free pancakes and sausage. Free scantrons and blue books will be available for students. Every night throughout finals, students can get free coffee and donuts. Students can watch "Night School" starring Tiffany Haddish and Kevin Hart. Limited seating is available. Students who hold on-campus dining plans are invited to eat free pancakes and sausage links at the above locations. Commuter dining plans and visitors will pay a guest rate. De-stress from final exams by playing with furry friends from the South Plains Obedience Training Club. Certified therapy dogs will visit Texas Tech to help students relax while studying for finals. Weekdays from Thursday (Dec. 6) through Dec. 13, all commuter lots are open to any vehicle with a valid Texas Tech commuter ePermit. Other parking areas on campus will operate as posted on signs, including weekends. Faculty and staff are still on duty during finals and must use their Area Reserved lots, including R3, the lot by the University Library, weekdays from 7:30 a.m. to 5:30 p.m. Towing will be enforced in R3. Thursday (Dec. 6) buses will have limited service. The Masked Rider route will not run on Individual Study Day or during finals. On weekdays throughout finals, the Red Raider and Double T bus routes will run on a normal schedule. Routes will start 30 minutes early. Plan on arriving early if using the buses. Buses will not run on weekends due to open Area Reserved lots. Students, faculty and staff are welcome to visit the MindSpa throughout finals. The MindSpa offers a zero-gravity massage chair, meditation techniques and an audio-video library with resources for yoga and breathing exercises, Biofeedback software to help manage stress, relaxing Xbox 360 games and more. For more information, visit the Mindspa website. During finals, students will have access to computers at the Learning Center. Students also can make appointments for free academic coaching to help with time-management, goal-setting, note-taking, study strategies and test-taking tips. Resources also are available online. Hospitality Services locations will be experiencing changes in hours during finals. Starting Thursday (Dec. 6), all on-campus locations will have different hours. Visit the Hospitality Services website to view finals dining hours. Throughout finals, the SUB will be open 24 hours for all students with one exception: the SUB will close at 11 p.m. Saturday (Dec. 8) and reopen at noon Sunday (Dec. 9). After finals have completed, the SUB will close at 11 p.m. Wednesday (Dec. 12). A full schedule of operating hours is available online. During finals, Student Health Services at the Student Wellness Center will operate under normal hours (8 a.m. to 5 p.m. Monday through Friday). Beginning Thursday (Dec. 6), the Learning Center hours will be shortened to 8 a.m. to 5 p.m. Only computer use and academic coaching will be available. Thursday and Friday (Dec. 6-7) the Rec will shorten its hours to 6 a.m. to 10 p.m. From Saturday through Wednesday (Dec. 9-13), the Rec will shorten its hours to 6 a.m. to 8 p.m. The Aquatic Center and Turf Fields will be closed throughout finals. A full schedule of the Rec hours is available online. During finals, IT Help Central will be open for phone, email and walk-up support during their normal hours. Phone and email support will be available weekdays from 7:30 a.m. to midnight, with changes in times on the weekend. Walk-up services will be available weekdays from 7:30 a.m. to 8 p.m. with changes in times on the weekend. For a complete schedule, visit the website. The University Library will be open 24 hours throughout finals. On Dec. 12, the University Library will close at 8 p.m. The Architecture Library, Southwest Collection and Law Library also will experience changes in hours. For a full schedule of University Libraries' hours, visit the website. Student Union & Activities promotes student success by offering a variety of programs, activities, services, and facilities that, when taken together, represent a well-considered plan for the development of community at Texas Tech University. 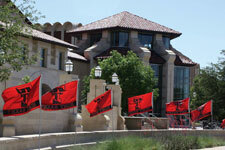 The Student Union is the community center of the Texas Tech University campus. It provides an environment for relaxation, social interaction, education and exchange of thoughts. It serves Tech students, staff, faculty, alumni and the greater Lubbock community. Student Activities complements the University's academic programs. It enhances the overall educational experiences of students through development of, exposure to, and participation in social, cultural, multicultural, intellectual, recreational, traditional, community service and campus governance programs. The Robert H. Ewalt Student Recreation Center opened its doors for the first time in the spring of 1980 and is one of the largest campus recreation facilities in the United States. It offers students, faculty, and staff of Texas Tech University an outstanding opportunity to participate in almost any indoor recreational activity imaginable. There are 242,000 square feet of activity space in the Recreation Center and eight courts with multipurpose flooring to accommodate basketball, volleyball and badminton. The Department of Hospitality Services will challenge students to become active participants in their individual learning experience by enriching each guest's experience through excellence in services, staff development, technological advancements, cutting edge facilities, sustainability, and performance. Check out the many dining locations across campus.